Resistant to shock and water, you won’t find another watch that comes even close to matching the toughness and durability of this trooper. 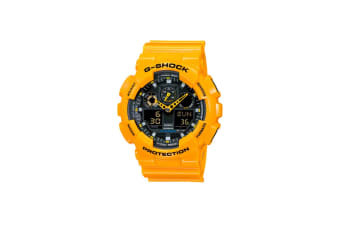 The champion of all watches, the Casio G-Shock Ana-Digital Watch is as tough as they come. With 200 metre water resistance and superior shock and magnetic resistance, there is no obstacle too challenging for the Casio G-Shock Ana-Digital Watch to conquer. With a stylishly designed interface combining analogue and digital faces, treat yourself to the best of both worlds with a Casio G-Shock Ana-Digital Watch today.